The owner of the Carlisle-based Stobart haulage firm has unveiled a trio of deals as part of its expansion. Stobart, formed by a merger between ports group Westbury and Eddie Stobart last year, is to buy rival transport firm Irlam for £59.9 million. It also plans to pay £10m for engineering specialist WA Developments. The third project includes ambitious plans to develop Carlisle Airport for commercial and freight flights by 2009 and to build a new base at the site. Stobart currently operates from six sites around Carlisle, but eventually plans to operate from one single purpose-built location. It said no job losses would occur as a result of the move. Cheshire-based Irlam's 263 trucks will not be rebranded in the famous green Eddie Stobart livery that inspired an official spotters' club, instead keeping their distinctive red colour. 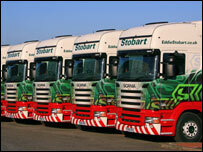 Stobart was originally formed in the 1950s and became a public company last year after the Westbury merger. It has more than 900 trucks and 1,500 trailers and following the acquisition will boast 3,600 employees. Can Eddie Stobart conquer the skies? Where next for 'Steady Eddie' Stobart?